The victory was an impressive achievement for rookie player/coach Ben Morgan and he has spent much of this summer forming a team to push on from winning the League. Continuity has been the key word - he has only lost two of the squad that finished the last campaign: Greg Wood who had been tempted out of retirement at the signing deadline and Lloyd Gibson who has decided to take a break from playing. Morgan’s search for new players extended a lot further than South Yorkshire and this was aided by the Steeldogs' status as champions. Twenty seven year old forward Nathan Salem was the first acquisition having played his youth hockey in Whitley Bay and played for the Newcastle Vipers. In recent seasons he had been a thorn in the Dogs side at rivals Telford and Hull before spending last season in Peterborough where he was top scorer. The second new addition started last season in the Elite League; Duncan Speirs is only 21 and has played for both Braehead Clan and Edinburgh Capitals and, following a move to Solway, was man of the match both times he played in Sheffield last season. 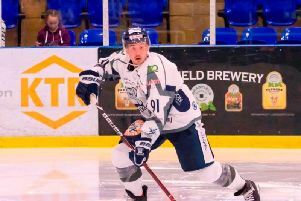 The forward will also train with and play for Elite League Manchester Storm when not needed by the Steeldogs. Coach Morgan says he is pleased to add two quality forwards in front of last season’s tightest defence. “Nathan is a great signing and Duncan came out of the blue - a testimony to the club that we are in this position to attract players of such quality. 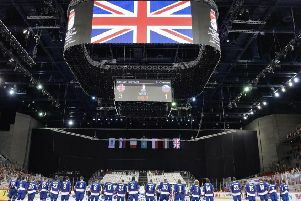 "They want to come to Sheffield and play for a club that is genuinely challenging for honours, a club playing entertaining hockey, playing aggressive hockey and playing honest hockey. “It’s not the team I originally had on paper looking at the back end of last season but it is a team which is stronger and I am certainly not complaining. Steeldogs take on the league's newcomers, Sutton Sting on Monday. The game will be a first chance to see those two new Dogs in action as they take on a Sting team including many ex-Scimitars and Steeldogs. Face-off is 3pm at iceSheffield.